After finishing my painting at Mountain Lake and cooling off with a refreshing dip (see my last post) I continued up the road that leads to the top of Mt. Constitution. 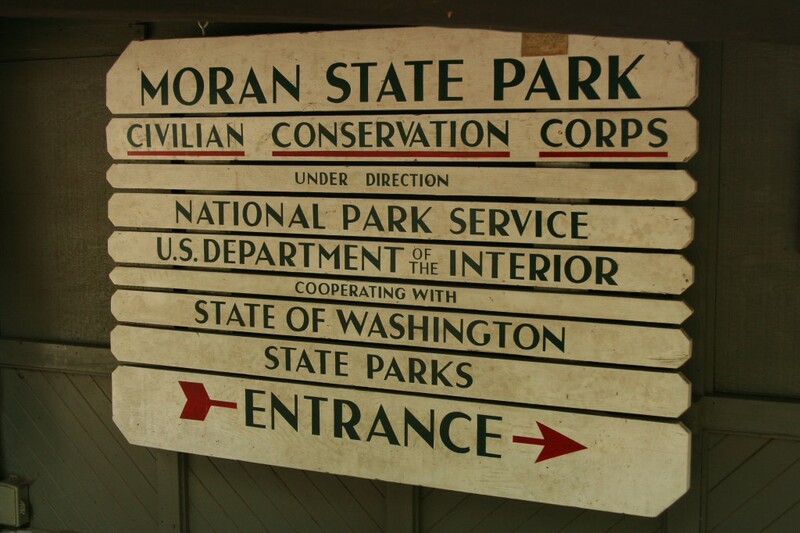 The original land for Moran State Park was donated to the state in 1921 by Seattle mayor and shipbuilder Robert Moran. 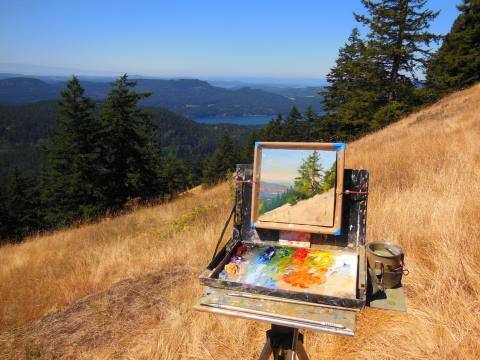 Due to poor health, Moran moved to Orcas Island and between 1906 and 1909 built his estate, naming it Rosario. 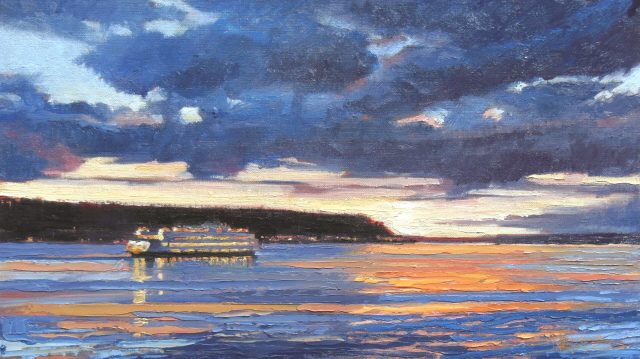 Today, the former Moran estate is Rosario Resort and Spa . It is the largest resort in the San Juan Islands and is listed on the National Register of Historic Places. Before getting to the top a stunning view of the distant Islands across some beautiful meadows stopped me. I hopped out to take a few pictures.... and had to pull out my gear and do a painting! 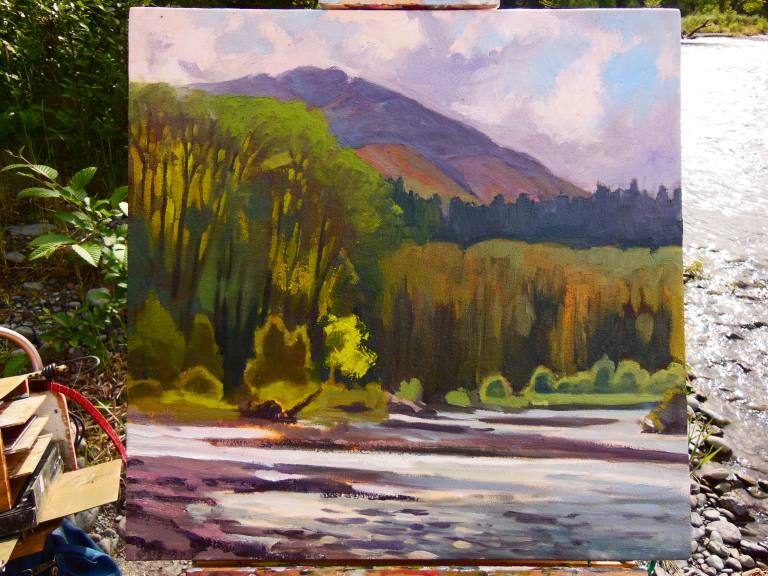 This painting sold rather quickly at the Moran exhibition held by Crow Valley Pottery at the end of our trip. 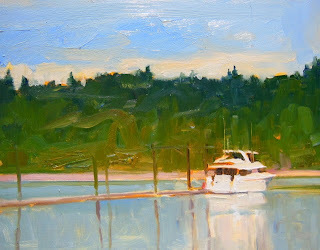 The second day of the San Juan Island painting trip found me back up at Mountain Lake to catch the morning sun. 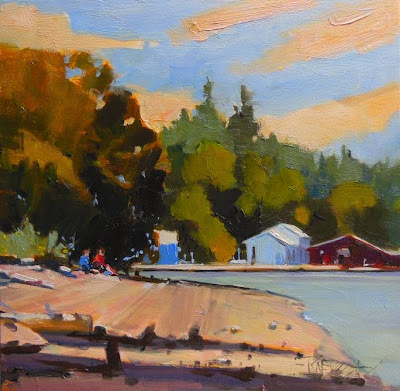 BTW, this trip was part of a Plein Air Washington Painters collaboration with Crow Valley Pottery to celebrate and support Moran State Park on Orcas Island . At the end of the week a gallery show was held at Crow Valley and a portion of the sales were donated to the park. 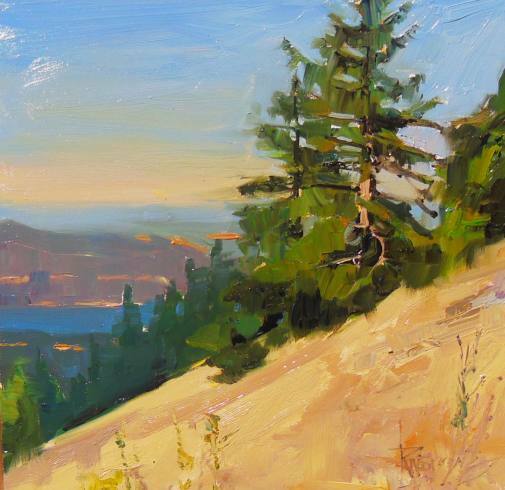 The show included studio paintings and the wet plein air work done during the week, of Moran and other state parks. Living in Kitsap county in the Pacific Northwest means that your travel off the peninsula is bound by the ferry schedule. To get to the paintout in the San Juan Islands required taking two ferries , I chose to take the Kingston Ferry to Edmonds and then drive up to Anacortes taking another ferry to Orcas Island. Knowing that I would be in line way early for the 3:50 pm sailing, I decided to pre-funk the party and do a painting at the ferry landing in Anacortes. 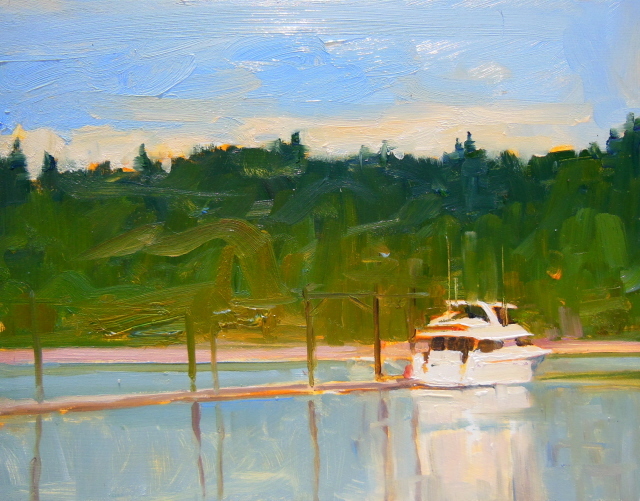 The adventure was now really under way, with a painting already under my belt.. We had gorgeous weather the whole time and the ferry ride itself is a treat worth the time! 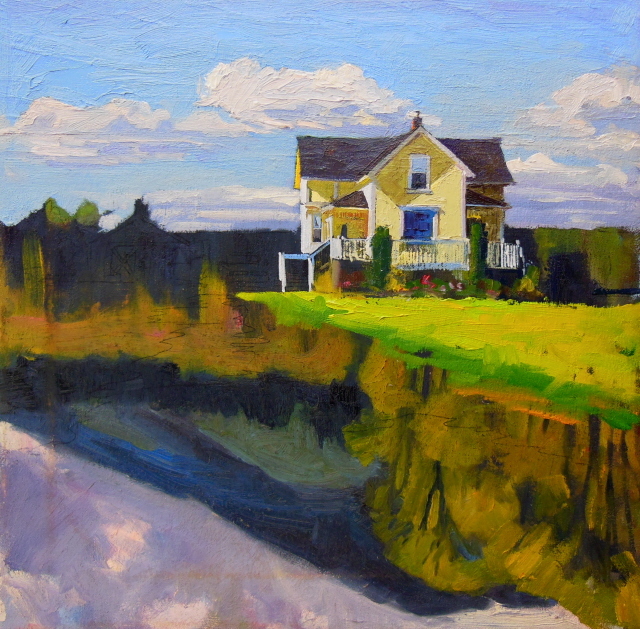 This is one of those paintings that got lost in the shuffle...Here's the story...I painted it awhile back and was never really satisfied but let it go to the gallery anyway because I needed to fill a show..(bad idea, but it happens to all of us) It sat in the gallery for a month and didn't sell....finally the gallery owner, a sweetie, fessed up that she didn't think the ferry boat was painted with the same quality as the rest of the painting .....So, took er back and repainted the ferry boat .....I think it's better? p.s ..It is now 5pm and I am STILL on this %$#$%^& computer! 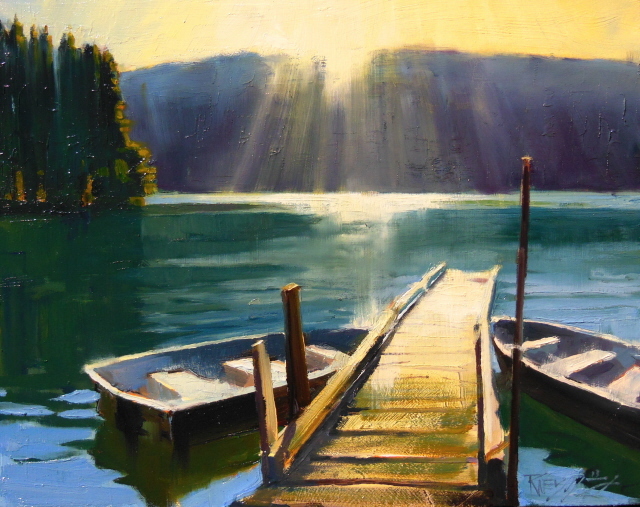 Just a quick one today to post the other two paintings I did with my artist friends Darrell Anderson and Tim Deibler. As you can see it was a beautiful, sunny, summer day in the Pacific Northwest and Seattle is visible in the distance across Elliott Bay. Thanks for visiting! 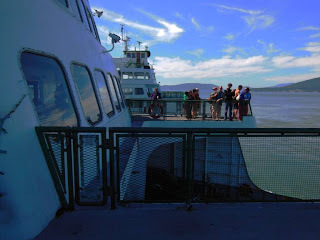 I will be moving on to my trip to the San Juan Islands in coming posts.....with more videos! !....=] Cheers! 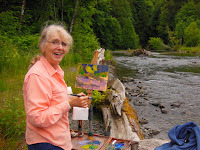 Friend and painting buddy Darrell Anderson called me to go painting with him at Prichard Park on Bainbridge Island with fellow painter Tim Deibler. 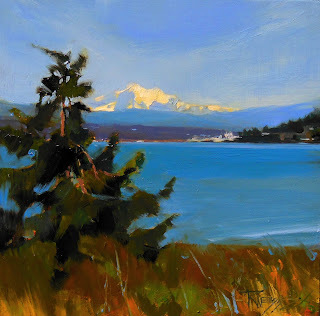 Tim was in town from Colorado teaching a workshop and wanted to do a warm up at the location. Darrell was nice enough to invite me along! 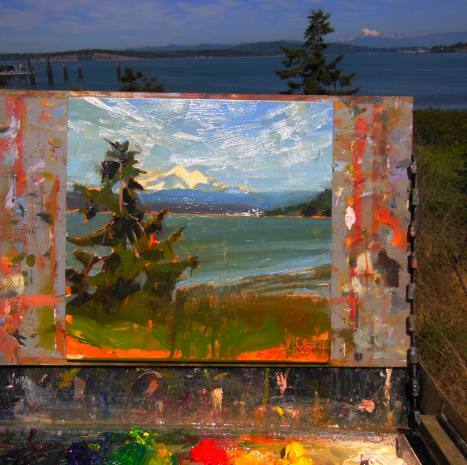 Tim is a great painter and a fun guy to paint with! One of the things I love about this business is meeting like-minded folks who love what they do and have a lot of fun doing it! The last plein air painting I did at Dosewallips State Park shows the Olympic Mountain Peaks known as The Brothers. A good wrap up to a great weekend! Skipping a few segments of the video series, (where I work on an 18x18 plein air piece down on the river), I will get to the last one and then post a picture of the final result of the whole process ......A totally different subject being painted over the work which I was never satisfied with.. 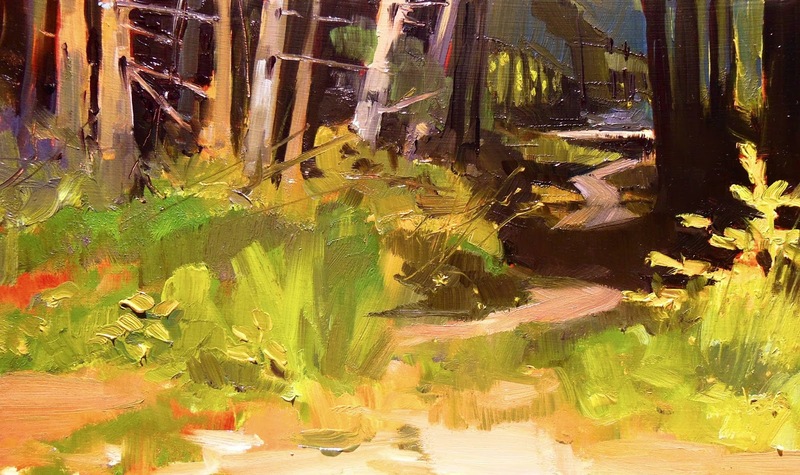 I spent three days on location with this painting and then took it back to the studio and worked on it some more...I was never able to bring it to a level I thought was frameable. ...so I waited until it was dry , sanded it lightly and used it for an interesting under-painting for another work...Some of the older painting peaks through and adds some sparkle. I turned it upside down before painting over it so as not to be distracted by the original image. 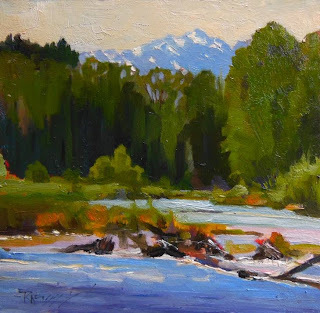 Second day , everyone showed up!...They all wanted to paint the river but since I already did, several times, I turned my easel around and painted the path coming down from the camp sites. Kathryn Townsend and Jane Wallis were among the many PAWA painters who showed up to enjoy the beautiful river views. 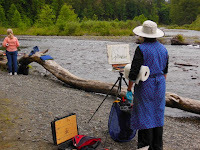 At the end of the day I returned to my spot on the river and continued on with my 18x18 plein air painting.